Traveling is the time for relaxation and leaving all the tasks and worries of everyday life behind. 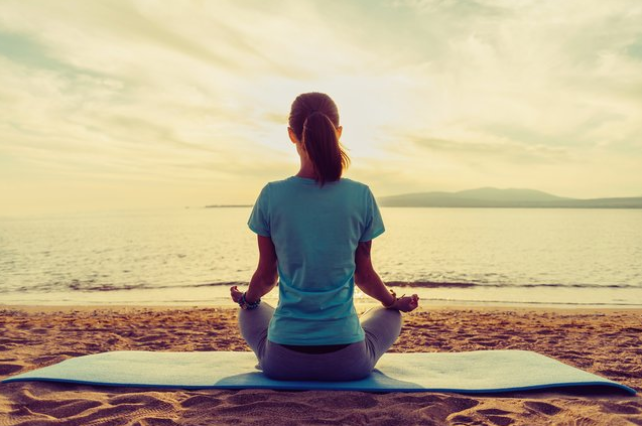 However, for many yogis, yoga is not just one of their duties, but a place where they want to return even on their vacation — finding time and place for yoga while traveling can be very challenging. There are a few tips you can use to make this quest easier for you. Before all, it is essential to go with an intention and decision for practice. Pack your yoga mat or just a towel if yoga mat takes up too much space in your luggage. If you are a regular traveler, there are some light mats designated for travels, which take up a tiny bit of space and can, therefore be a great investment. Pack some workout clothes too, yoga leggings and a t-shirt are lightweight and easy to carry along with you. A part of your preparation is also choosing what type of practice you plan to do. It should be a simple, easy to remember sequence. With your class already planned, returning to the mat during your traveling adventure will become much more effortless. Choose your practice realistically; it is much more important to have continuity than to include a full class. Since traveling is a very dynamic and stimulating experience, it will make you excited but also exhausted at the same time. Since the most dominant energy in traveling is Yang or active energy, you should do some yin or passive exercise to keep yourself balanced. Yin exercises are included in yoga styles such as Yin, Restorative and Nidra yoga. You can choose to practice ready-made classes from these styles or to make your own sequence instead. This practice should be slow and static, picking postures that are not a big obstacle to you. Include forward folds and twists the most to get your back and spine back in place. These postures can also be done in smaller places which is great if your hotel room is not big enough for all the exercises. You can also practice on your bed; many believe that hip stretches done on the bed make you flexible quicker. The most obvious choice would be your hotel room since there you have the most privacy. It is also the best choice for goodnight practice moments before bedtime. On the other hand, nothing beats practicing on the fresh air, and there are many places you can practice on the go. It could be any grassy area, the beach, a nearby park or the forest. If you are brave enough, nothing stops you from practicing on squares or an airport while waiting for your flight. Going public with your practice will break your boundaries, and you could also have other yogis approach you. Almost in every place in the world, you can find a yoga class or a studio. Try to find some on Google or ask the locals about it. It gets all the planning and organization out of your mind, still allowing you to get the practice while staying relaxed. It is also an awesome opportunity to try and learn things you usually don’t do and to connect with like-minded people in the place you are visiting. Even if you don’t succeed in regular practice during your travel, it is not really a big deal. Having a rest period can be very rewarding. You can spend some time to plan your practice upon your returning home instead. Having some time off the mat can give you a fresh start once you get back home. What’s more satisfying than an ice-cold beer while flowing towards consciousness? Beer and Yoga lovers, a sweet treat for you all! The fantastic duo of beer and Yoga have finally found their way to each other. Introducing Beer Yoga – where you can stretch out while having a bottle of your favorite beer. Both Yoga and beer are very effective mediums for relaxation and happiness, and as a result, this new trend is gaining more popularity, both among Yogis and beer lovers. This practice was popularized as BierYoga in Germany. BierYoga founder Jhula was influenced to practice Beer Yoga when she saw it at Burning Man, an American culture, desert party show. Even if German people are very well-known beer lovers, this influence wasn’t only felt in Germany, but it slowly gained popularity all over the world. 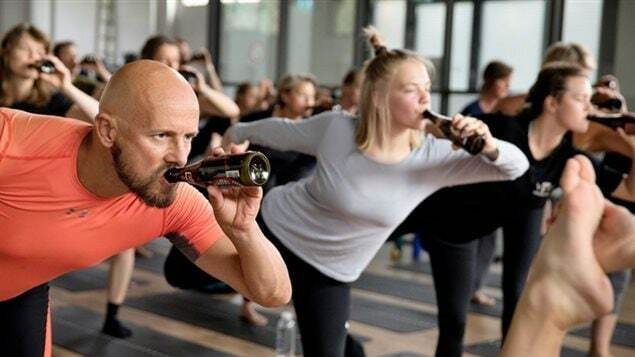 Though drinking your beer is intended to be done after classes, some Beer Yoga classes also incorporate drinking while flowing. Here are some poses you can try to make your Yoga session more fun and relaxing experience. 1. Warrior I: This pose effectively increases your leg strength and stretches your gluteus. It is also a gentle hip opener. How: Place the bottle of beer on your front, outside the mat. Begin in a plank position. Inhale as you place your right foot between your hands, and turn your left foot 45 degrees outwards. Stand up, stretch your left leg while sending your hips forward and keeping your right knee bent at a right angle. Pick up your bottle of beer and hold it to your chest with both hands. Inhale, extend your arms up, lifting your beer bottle. Hold the pose for five breaths, then exhale, lower it down and take a sip. To release, place your beer bottle back to the ground and lower your body back to the plank pose. 2. Wide-Angled Standing Forward Fold: This standing pose stretches the lower back down to hamstrings and calves. It is also very effective at relieving headaches and sending freshly oxygenated blood from the lungs to the brain. How: Stand with a distance of 4-5 feet between your toes. Hold your beer with both hands in prayer. Then, inhale as you extend your arms up, and exhale, as you slowly fold forward by the waist, bringing your bottle of beer to the floor. Fold deeper by reaching your chest to your legs. Remember to always keep your spine long throughout the whole flow. Stay in this position for 3-5 breaths. Stand back up as you pick up your beer bottle into prayer and bring your feet together to release. There are many contradictions about Beer Yoga. If you are a strict traditionalist Yogi, you may not find Beer Yoga as satisfying as your usual flow. However, if you are someone who wants to spice up your routine in a fun and relaxing way, Beer Yoga is a must try! As you flow and take a sip of your ice-cold beer, wearing Yoga pants that will allow you to move freely, can effectively intensify your Yoga session. The kind of workout clothes that will maximize your range of motion should allow proper blood circulation and bring comfort. The more comfortable your leggings are, the more relaxation they promote. Hue Ultra WW Leggings. These mid-rise Yoga pants for women are very comfortable, durable and fashionable at a very friendly price. Their fabric supports the leg muscles firmly without any tightness and constriction, and they come in a wide range of colors. The color of the Hue Ultra WW Leggings’ never fades even after an uncountable number of washes. Make sure to order one size down for flattering fit and comfort. Women that have gone through one or more pregnancies can tell you how hard it is on your body. It is common to hear about weight gain, aches and pains, and a host of other personal health issues. While not many pregnancies are going to be all sunshine and rainbows, there are things you can do to make it as comfortable as possible. It is perfectly normal, and even necessary in most pregnancies, for you to gain weight. You are literally growing another human in you; a couple of extra pounds is to be expected. Ballooning up in weight, on the other hand, can and should be avoided. Extreme weight gain can be a sign of gestational diabetes or excessive water retention. Both scenarios should be checked out by the doctor, and regular prenatal care is always recommended. In the case of a healthy pregnancy, you can be mindful of what you eat. Your body tries to tell you what it needs through your cravings. Sticking to nutrient dense food will help you satisfy these cravings, supply your growing baby with the necessary nutrients, and maintain a healthy level of weight gain. A healthy balanced diet will also help you deal with other symptoms of pregnancy; things like excessive gas, heartburn, and constipation are regular pregnancy complaints that can see improvements with a healthy diet. Activity goes hand in hand with your food choices. While pregnancy, especially in the later months, can be very uncomfortable, regular gentle exercise can help you feel better. Studies have also pointed to a correlation between activity in pregnancy and shorter labors, and who wouldn’t want a shorter labor? There are many different activities that are totally safe well into pregnancy. 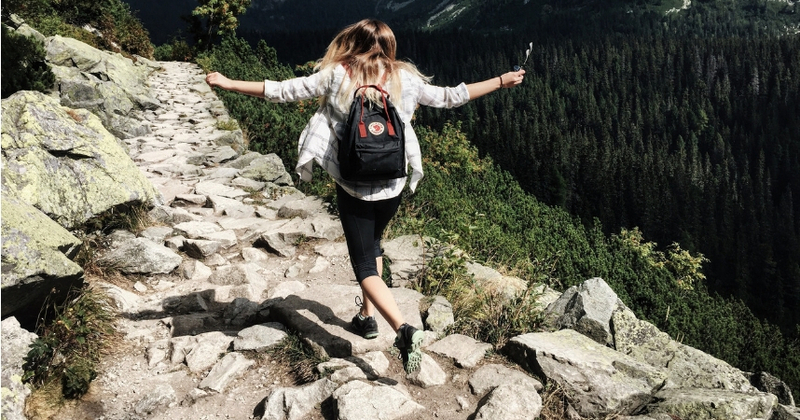 Walking is probably the simplest activities you can do. You can walk pretty much anywhere, and it is low impact. It is safe all the way into labor and is actually used in hospitals to help move labor along. Yoga is also strongly recommended to keep your body limber and strong throughout pregnancy. There are many different pregnancy specific yoga classes and videos. They will stick to more gentle positions that focus on opening your hips and stretching your back. These are the most common troubles facing pregnant women and can greatly improve your comfort throughout your pregnancy. Having a healthy pregnancy is giving your child the best start to life. Making sure that you are eating well, and including nutritious foods is critical. You will find that good food choices feed your baby right, reduce your cravings, and can keep you at a healthy weight. In addition to making smart food choices, staying active can help you throughout your pregnancy and even into labor. As your pregnancy progresses, you may find your belly gets in the way of some yoga positions, and that your overly loose joints prevent some others. It is perfectly safe to perform yoga well into your pregnancy, as long as you listen to your body. Finding a good balance of stretching, rest, and movement will have you almost enjoying your pregnancy, right up to the last day.